It will be Anzac Day this weekend, the centenary of the first Anzac landing at Gallipoli on April 25 1915. As well as services all over Australia and New Zealand, there will also be Anzac Day ceremonies in Turkey, and at Villers-Brettoneux in northern France. The rosemary plant has long been connected with Anzac Day ceremonies, and it is traditional to wear a sprig in your coat lapel, pinned to your breast, or held in place by war medals. They are often sold by Legacy and the RSL. It is not known when this tradition first started, but it may date back to the very first Anzac Day commemoration in 1916. According to the ancient Greeks, who drew on the work of Arabic physicians, rosemary improved the memory (students would wear it in their hair during exams), so it became associated with remembrance. Rosemary was thrown into graves or sprigs worn by mourners as a sign the departed person would never be forgotten (and to ward off the smell), and it’s famously referenced in Ophelia’s speech in Shakepeare’s Hamlet, where she says, “There’s rosemary, that’s for remembrance”. Interestingly, rosemary’s connection with memory is more than mere superstition, because modern science has found that inhaling rosemary oil does significantly enhance memory, and that even small doses of rosemary improve cognitive function in the elderly. 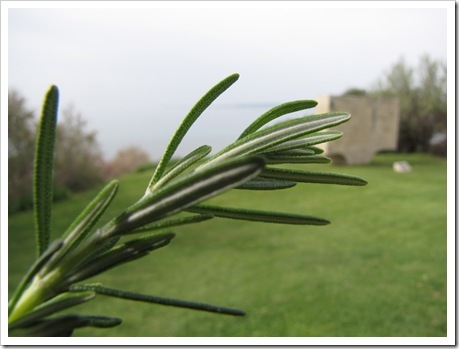 While the connection with rosemary and remembrance for the dead is one that goes back thousands of years, it takes on a particular significance for Anzac Day, because rosemary grows wild on the Gallipoli Peninsula. The scent of rosemary, whether it is pinned to your clothes, planted in a garden as a memorial, or sprinkled over a traditional Anzac Day lamb roast, is the perfect mark of remembrance and commemoration. Rosemary can be seen as a combination of the names Rose and Mary, or as a reference to the aromatic herb. The plant rosemary has nothing to do with roses, because its name comes from the Latin ros marinus, meaning “dew of the sea”. This is because it grows naturally in dry coastal Mediterranean climates. According to legend, Aphrodite was draped in rosemary as she rose from the sea foam. Perhaps because of this, and the association with everlasting memory and fidelity, rosemary was associated with love in the Middle Ages, and it was traditional for brides to wear rosemary wreaths, and for guests to wear a sprig of rosemary at a wedding – even now it’s said that a bit of rosemary in the wedding bouquet brings the bride good luck. There are many love superstitions involving rosemary in folklore, including the charming one that a newly married couple should plant a rosemary branch in their garden together: if the branch takes root and flourishes, it is a good omen for their wedded life. There are Christian legends about rosemary too. One tells how the flowers of the rosemary plant were originally white; the Virgin Mary spread her blue cloak on the bush while she rested, and when she removed it, the flowers had miraculously turned blue as a reward for their humble service. Another legend says that she placed the linen from the baby Jesus to dry on the bush, and ever after the plant carried a fresh aroma, while a legend from Spain says that the Virgin Mary sheltered beneath a rosemary plant during the escape to Egypt. It is sometimes called Mary’s rose because of these stories. Rosemary was one of the plants associated with Christmas. Being an evergreen plant, it was suitable for winter time decorations, and rosemary has a habit of being able to flower even in cold weather. Christmas hot wines and ales were sometimes flavoured with rosemary, which was considered salubrious as well as festive. Rosemary was also a popular New Year’s gift in times past. Whether it was because of the connection to the Virgin Mary, or because rosemary has such a strong, healthy odour, it was also seen as a protective plant: according to folklore, by planting rosemary in the garden you were safe from witches, although in Sicily they say fairies will live in rosemary. It is said that rosemary will not grow in the garden of an evil person. With such strong connections to female power, the superstition developed that if rosemary thrived in a garden, it was a sign that the wife of the house was the boss! As rosemary is hardy and easy to grow, you would need to be a very bad gardener for your rosemary to do poorly, but my husband still likes to teasingly point out our healthy rosemary plants as a sign of who rules the home. He’s only joking, but in the past, some men would rip the rosemary from the kitchen garden in an effort to control their wives. Rosemary’s history is connected to royalty, because according to tradition, it was introduced to England in the 14th century by Joan of Valois, Countess of Hainault. She sent cuttings of it to her daughter, Queen Phillipa, the wife of Edward III, along with instructions on how to grow it, and information on its many benefits. Rosemary was probably brought by the Romans many centuries before, but Queen Phillipa may have re-introduced it, or at least given it a solid royal seal of approval. Although Rosemary was used as a personal name as early as the 17th century, it didn’t become common until the 19th, when flower and plant names were fashionable. It seems to have been a particular favourite with Catholic families, no doubt in reference to the Virgin Mary. Famous Rosemarys include Princess Rosemary of Salm-Salm, cabaret singer Rosemary Clooney, actress Rosemary Harris, and children’s author Rosemary Sutcliffe. Famous Australian Rosemarys include poet Rosemary Dobson, gardener Rosemary “Bea” Bligh, human rights activist Rosemary Gillespie, director Rosemary Blight (The Sapphires), nutritionist Rosemary Stanton, and paralympian Rosemary Little. Rosemary first entered the charts in the 1920s, when it debuted at #220 – it may have been a celebrity baby name, for the tragic Rose Marie, called “Rosemary”, had recently been born to prominent Boston businessman Joseph P. Kennedy. By the following decade it was already in the Top 100. It peaked in the 1950s at #60, when Rosemary Clooney’s career began, and left the Top 100 by the 1970s (it went down rapidly after horror movie Rosemary’s Baby, and real life horror story Rosemary West). After this, it sunk in popularity until the late 2000s, when it recovered slightly, and is now around the 400s. At present, it appears to be fairly stable. In the US, Rosemary has been almost continually in the Top 1000, and is now in the 500s and rising, while in the UK it has been steadily falling, and is now in the 700s. Rosemary is a modern classic with a vintage vibe, and US data suggests it may become one of the 1950s names which becomes fashionable in the future. You may think of it as a name to honour a Rose and a Mary simultaneously, or even as a name suitable for a baby girl born around Anzac Day. It doesn’t really have a sweet old-fashioned feel, for the herb rosemary gives it a tang. Its connection to weddings and Christmas helps it feel festive, while its association with mourning and funerals adds depth. Rosemary is strong, clear-minded, clean, and healthy – as fresh as a sea breeze, as lusty as a goddess rising from the waves, as pretty as a bride, as practical as a housewife, as dignified as a queen, as dear as memory, and as solemn as the grave made sweet by her scent. Rosemary received an excellent approval rating of 89%, making it one of the highest-rated names of 2015. 37% of people thought the name Rosemary was okay, and only 3% hated it. Rosemary has really grown on me over the years (no pun intended). A family friend chose it for her daughter in the early 90s and I have liked it ever since. This name has a gentle and quiet strength and sensibility to me, it’s also one of my favourite herbs to cook with. I think Rosemary is very sensible and wholesome sounding – we have rosemary planted all along the back of our house, and the smell is so healthy and cleansing. I can understand why it was seen as warding off evil: it’s hard to imagine anything bad happening within the smell of rosemary bushes. I always associate the name with that clean, clear aroma.